Continuing the outline format and chronology of Streamline Pictures history, where I was employed from January 1991 through March 2002. This week I cover the company’s output from 1994 through 1996. Crying Freeman #1 and Doomed Megalopolis #4 were released. Megazone 23, Part 1 and Megazone 23, Part 2 premiered theatrically at the U.C. Theater, Berkeley, CA, on February 2. Streamline 3D premiered its first four resin model kits, the Speed Racer Mach-5, Shooting Star, the GRX “Fastest Car in the World”, and Gang of Assassins racing cars, at the Mad Model Party model show, on February 12 – 13 at the Beverly Garland Hotel in North Hollywood, CA. When I had any “spare time” from my regular duties, I was expected to go back to the 3-D workshop and help pull the tiny resin steering wheels and other parts from the casting molds. Akira in Japanese with English subtitles and Lupin III: Tales of the Wolf #2 were released. Streamline arranged with JVC (Japan Victor Corporation), the producer of the Akira Original Soundtrack CD in Japan, to produce an English-language version for the U.S. The CD was basically the same as the Japanese release, with a new English-language cover. 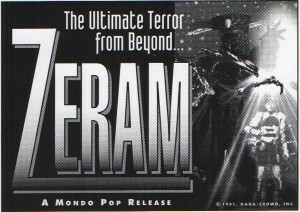 This was not a Streamline release, but Streamline considered it as promotion for its Akira theatrical and video releases. Dirty Pair: Project Eden was released. Great Conquest: The Romance of Three Kingdoms premiered theatrically at the Cleveland Cinematheque, Cleveland, Ohio, on April 21 – 24. 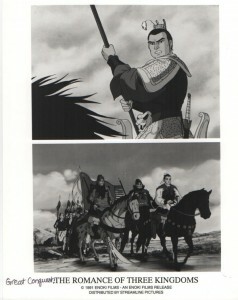 This was the 1992 Japanese theatrical animated feature Sangokushi (Tōei Dōga, 135 minutes), based on Mitsuteru Yokoyama’s manga adaptation of the classic 14th-century Chinese “novel” of the breakup of the Han dynasty Chinese Empire into three separate kingdoms that warred to reconquer each other until one won, from about 169 to 280 A.D. The Romance of Three Kingdoms had been filmed many times in China and Japan, theatrically and as a TV serial, in both live-action and animation by then; this was its first Japanese theatrical animated version. 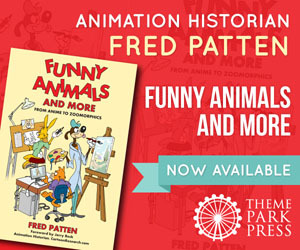 Much of its background was left out because the Chinese history is as well-known in both China and Japan as the 19th-century American Civil War history is known in America; but since the movie is such a condensation of 120 years of ancient Chinese history, Carl spent more money than in Streamline Pictures’ history on a single voice actor to hire actor Pat Morita to provide a voiceover narration to explain what an Oriental audience would have known. Robot Carnival, Twilight of the Cockroaches, and Vampire Hunter D premiered on the Cartoon Network on April 30th. Nadia vol. 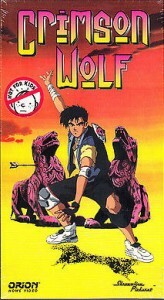 1 (the first four episodes) was released as a bilingual laser disc by Lumivision. Crying Freeman #2, Dirty Pair: Flight 005 Conspiracy, and 8 Man After #1 were released, along with both volumes #2 and #3 of Robotech Perfect Collection: Macross, Robotech Perfect Collection: Southern Cross, and Robotech Perfect Collection: Mospeada. 3 X 3 Eyes (all four parts) was released as a bilingual laser disc by Lumivision. Cornerstone Communications, Inc. released the Akira trading cards. This was the first American trading card set devoted to an anime feature film. Streamline designed the fifty cards, which Cornerstone printed. I chose the fifty images from throughout the movie, and wrote the back-of-the-card captions. The cable channel Network One began to broadcast Streamline’s titles on July 22nd. This was the first regularly-scheduled weekly series of anime features broadcast nationally via satellite. Crying Freeman #3 and Lily-C.A.T. were released. Wicked City was released on the Video Comics label. Streamline made a major advance in getting anime into mainstream American popular entertainment by entering into an agreement with Orion Home Video, allowing Orion to distribute Streamline’s Video Comics to general video retailers and the entire sell-through market. Many histories of anime in America today make it sound like, or openly state, incorrectly that Streamline Pictures was always an Orion subsidiary. It never was; but the contract that Carl signed gave Orion veto power over the anime properties that Streamline acquired. At the time, Carl again expected the alliance to help publicize and spread Streamline’s videos through Orion’s much larger advertising budgets; but two years later it essentially killed Streamline when Orion started vetoing any new anime acquisitions or renewing any existing licenses when they expired. Orion Home Video did, however, prepare a snazzy trailer promoting the Streamline Video Comics. 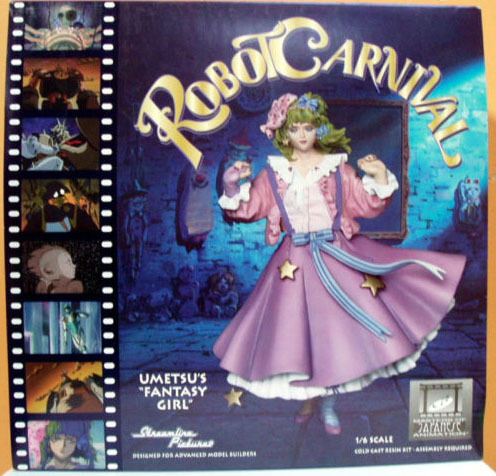 Cornerstone Communications, Inc. released the Robot Carnival / Masters of Japanese Animation trading cards. 8 Man After #2 was released. Crying Freeman #4 and 8 Man After #3 were released. The first Orion Home Video “flight” of six Video Comics titles was released: Akira (full frame edition), Dirty Pair: Affair on Nolandia, Fist of the North Star, The Professional: Golgo 13, Robotech II: The Sentinels, and Vampire Hunter D, all with new packaging. Robotech Perfect Collection: Macross #4, Robotech Perfect Collection: Southern Cross #4, and Robotech Perfect Collection: Mospeada #4 were released. 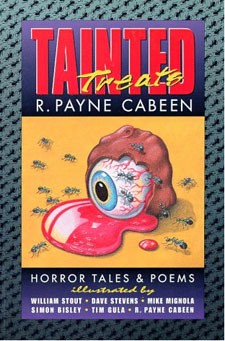 Streamline published its first book: Tainted Treats, by R. Payne Cabeen, a horror collection of stories & poetry; illustrated by himself and four comics-artist friends: William Stout, Dave Stevens, Mike Mignola, and Simon Bisley. Bob Cabeen was an old friend of Carl’s who helped him on a freelance basis on many of the dubbing projects. He was a long-time fan of the horror fiction & fantasy by authors like H. P. Lovecraft and Robert Bloch, and also of Mad magazine; and a talented artist. I don’t know whether Tainted Treats was Carl’s or Bob’s idea first, but both got very enthusiastic about it. This was just before the advent of print-on-demand technology, but Carl found a printer in Florida that would do a short run of an attractive trade paperback very cheaply. It was to be the first of several Streamline Pictures books that would go far beyond Japanese animation. We talked about my editing some new s-f/fantasy anthologies to take advantage of my separate interest in the new furry fantasy field. (Nothing came of this at the time, but I have since edited seven anthologies of furry s-f/f, and I’m currently preparing an eighth for July publication.) I helped Bob lay out Tainted Treats, and was assigned to use my s-f contacts to get a foreword or introduction from some famous author like Ray Bradbury. Bradbury never replied. I was next asked to get Robert Bloch. Bloch sent back a postcard, a couple of weeks before his death on September 23rd (we hadn’t known he was ill), that he was in the last stages of cancer and didn’t really feel like it. By then Tainted Treats was due to be published, so it never got an Introduction. The poem “Doctor Volmer” was given an Honorable Mention in The Year’s Best Fantasy and Horror: Eighth Annual Collection, edited by Ellen Datlow and Terri Windling (St. Martin’s Griffin, August 1995). Shortly after we moved to the new building, around January or February 1994, Carl showed his old friend George DiCaprio around. His son Leonardo, then just beginning his cinematic career, was with him. At the time I didn’t think anything of it. The younger DiCaprio was still three or four years away from becoming a major screen heartthrob. One of my favorite memories from the early 2908 Nebraska Avenue days was getting a complaint phone call. The voice sounded like a young teenage boy. He had mail-ordered the first Robotech Perfect Collection videos several weeks ago, and they hadn’t arrived yet. “I don’t know if your company has awful service, or if the Religious Police have intercepted them!” Religious Police? “I’ll ask my father to check.” He called back about three weeks later to say that his father had gotten the Religious Police to turn them loose, and the R.P. had promised that there would be no more seizures of his mail. I never found out for sure what this was about, but I assume that he was a son of a Saudi Arabian prince or at least of a high-ranking nobleman. His American English was perfect. From time to time, Carl put Streamline to work on projects that I don’t think were ever official company projects. I was never sure what their status was. I considered them personal projects of his that were supposed to turn into something, but never quite did. One involved dubbing Japanese live-action theatrical features into English, for theatrical or video release NOT by Streamline Pictures. One was a 1991 science-fiction movie, Zëiram. We produced it for an intended theatrical release — Jerry has the ad slicks to prove it — but Wikipedia says that it was a May 1994 Fox Lorber direct-to-video, with the title shortened to Zeram, and clumsily edited. This was later followed up by an anime sequel, Iria: Zeiram the Animation, but Streamline was never involved with that. Another was a 1992 live-action 8 Man feature; the same story as the 1963 manga written by Kazumasa Hirai. 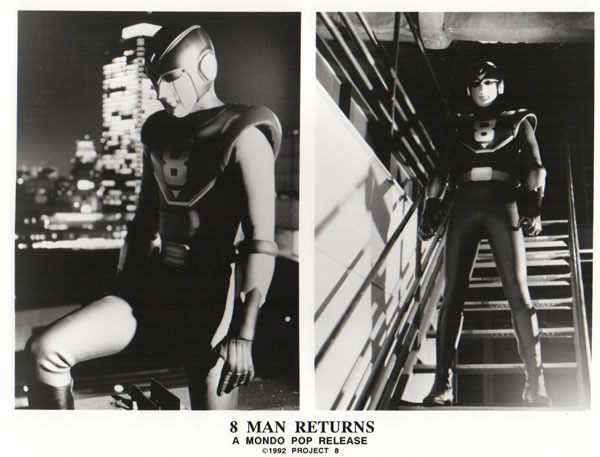 This came out at about the same time as the anime sequel, 8 Man After, which Streamline DID get. 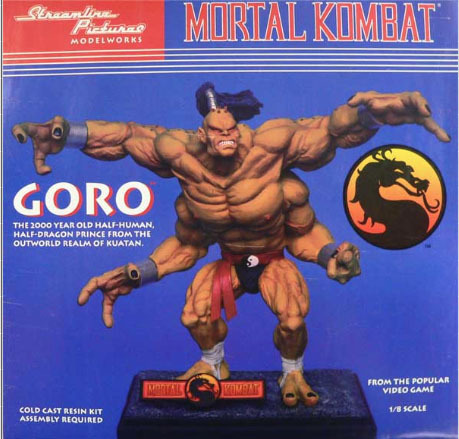 These were released in America on video under a “Mondo Pop” label. The 8 Man movie was also clumsily edited. Things like this came and went. Carl had a friend, Philippe Diaz, who was the president of a tiny company, Sceneries Entertainment, with some connections to French cinema. Carl was a personal investor in Diaz’s company. During 1996, Sceneries was trying to raise the money to make a live-action feature in France and Indochina of Andre Malraux’s 1930 novel La Voie Royale, set in the French colonial Cambodian jungle; and Carl had Streamline 3-D (which had become Streamline Modelworks) make a number of very attractive one-foot high resin models of a Cambodian temple dancer statue for Diaz to give potential backers. There were about two dozen for Sceneries Entertainment, and everyone at Streamline also got one. 8 Man After #4 was released. Crying Freeman #5 was released, along with Orion’s second “flight” consisting of Streamline’s first releases of Great Conquest: The Romance of Three Kingdoms, Lupin III’s Greatest Capers, and the 3 X 3 Eyes: Perfect Collection, plus reissues in new packaging of Dirty Pair: Flight 005 Conspiracy, Dirty Pair: Project Eden, and Lily-C.A.T. Streamline 3-D premiered its Robot Carnival model kits of the Dancing Robots from Katsuhiro Otomo’s opening sequence and the Fantasy Girl from Yasuomi Umetsu’s Presence sequence, at the Mad Model Party II model show on March 4 – 5 at the Holiday Inn Crowne Plaza in Los Angeles, CA. Al Zequiera ran a Streamline 3-D booth there. Robotech Perfect Collection: Macross #5, Robotech Perfect Collection: Southern Cross #5, and Robotech Perfect Collection: Mospeada #5 were released. Crimson Wolf and Lupin III: The Mystery of Mamo were released. Crimson Wolf (Hon Ran) was by far the worst stinker that Streamline ever released. Nobody liked it, but Carl said that we had to buy the license to get something else from Studio A.P.P.P. that we wanted. Crimson Wolf is one of the few anime titles that nobody else ever acquired after Streamline’s license expired, which is no surprise if you ever saw it. Imagi-Movies, v.2 #4, Summer 1995, published a major article on Streamline as part of its special “Fant-Asia” issue on horror, fantasy, & s-f movies from Hong Kong & Japan: “Streamline Pictures: Importers of Outrageous Anime; The Distributor of the Best in Japanese Adult Animation”, by Todd French (10 pages). 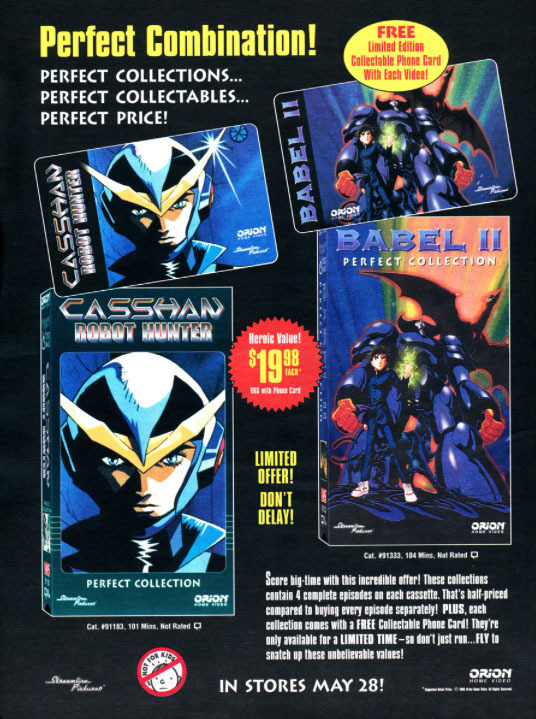 Orion’s third “flight” of Video Comics consisted of the first four Crying Freeman and first two Doomed Megalopolis titles, all in new packaging. Video Comics released include Babel II, parts 1 through 4, Barefoot Gen, Casshan, Robot Hunter, parts 1 through 4, and the Robotech Perfect Collection: Macross #6, Robotech Perfect Collection: Southern Cross #6, and Robotech Perfect Collection: Mospeada #6. Streamline 3-D formally became Streamline Pictures Modelworks. Its Robot Carnival models from Takashi Nakamura’s Nightmare and Hiroyuki Kitazume’s Starlight Angel sequences, and its licensed model of Prince Goro from the Mortal Kombat™ video game, were premiered at the 1995 San Diego Comic-Con, July 27 – 30; and a prototype of its first Heavy Metal cover art model was displayed. Streamline Pictures formally became Streamline Enterprises, Inc., to encompass both Streamline Pictures and Streamline Pictures Modelworks, and potentially further divisions. Carl had apparently been planning this for a long time; the Streamline Enterprises name appeared in small type at the bottom of my earlier business cards. Orion’s fourth “flight” of Video Comics consisted of Crying Freeman #5, Doomed Megalopolis #3 and #4, and Wicked City, and Streamline’s first release of 8 Man After: Perfect Collection. 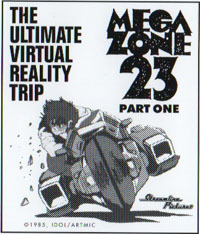 Megazone 23, Part 1 became a Video Comics release. Carl planned to add Parts 2 and 3 later, but did not get to them before Orion started vetoing all new titles. Video Comics premiered the Robotech Perfect Collection: Macross #7, Robotech Perfect Collection: Southern Cross #7, and Robotech Perfect Collection: Mospeada #7 titles at the Robocon 10: Robotech Tenth Anniversary Convention, Grand Hotel, Anaheim, CA, October 6 – 8. Space Adventure Cobra premiered theatrically at the Brattle Theatre, Cambridge, MA, on October 19. This theatrical feature, and the 31-episode Space Cobra TV series, were expected to become Video Comics during 1996, but Orion nixed that. 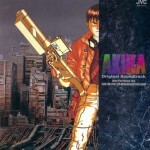 Streamline’s first music CD, the Robotech Perfect Soundtrack Album, was released. Carl had wanted it to include all of the original music for the Robotech TV series, and he developed close relations with both Ulpio Minucci and Arlon Ober, the Robotech music composer and orchestrator, but there were a couple of very short music tracks that had disappeared. They were later found and added to the CD, but that was after Streamline was gone and Harmony Gold USA re-pressed it. 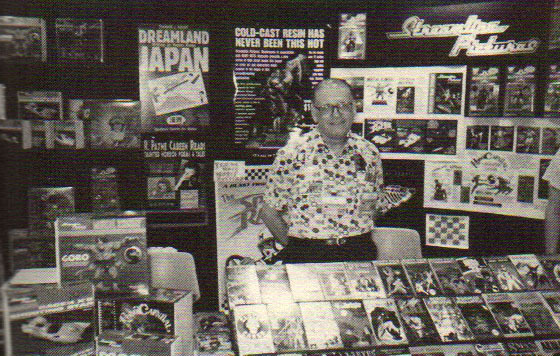 Streamline had had an exhibitor’s professional display booth setup at the San Diego Comic-Con since 1991. By the 1996 Comic-Con, Streamline had enough “product” (videos, model kits, a book and a CD) to fill it. We also had our theatrical movie posters to add to the decoration, and we were acting as Stone Bridge Press’ agent in promoting and selling its book, Dreamland Japan by Frederik Schodt. Streamline published its second book: Twilight Zone Scripts & Stories, by George Clayton Johnson, a collection of eleven original short stories and teleplays written by Johnson for The Twilight Zone. The book was actually a mix of original short stories by Johnson that Rod Serling had bought for Twilight Zone and had developed into scripts by other authors (that were not included), and scripts that Johnson had been asked by Serling to develop from stories or ideas by other authors. Sometime during 1996, or maybe it was late 1995, Streamline Pictures Modelworks hired a young craftsman, Wyatt Weed, who was also involved outside Streamline in the production of an independent martial-arts thriller-comedy movie, Drive, 99 minutes, being directed by Steve Wang and starring Mark Dacascos (with “Walter, the Einstein Frog”). Weed was listed in its credits as Director of Second Unit Photography. I don’t know how Streamline got involved with the production, but the Modelworks crew built a detailed miniature model of the two-story Desert Cradle Inn motel that was to get blown up in it. The model stretched across the entire floor between the Streamline offices and the Modelworks workshop, covered with a big dustcloth when it wasn’t being worked on. I had to step carefully across it for several months to avoid crushing anything when crossing between the Streamline offices and Modelworks. The movie, which was being filmed in a desert area outside Los Angeles, finally reached the point where the motel model was taken out to it and blown up, supposedly by the villain with a stolen U.S. Army rocket launcher. “Streamline Pictures, Inc.” was credited for Miniatures at the bottom of the closing-credits crawl. Drive was finished in 1997, and we waited for over a year while the production company tried unsuccessfully to get a theatrical distributor. 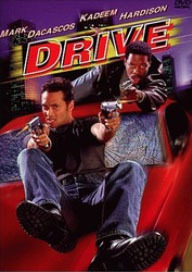 Drive was finally released in August 1998 as a direct-to-video VHS cassette; just before the home-video market switched to DVDs. Most of the reviews praised it as exceptionally good for a direct-to-video production. Rotten Tomatoes gave it a 69% positive rating. At the beginning, Carl hoped to get other work for Streamline as a builder of movie miniatures, but as it became clear that Streamline’s acquisition of anime was being sabotaged by Orion, and the Modelworks never had a chance to grow large enough for Streamline to survive on it alone, Carl stopped taking on any long-term commitments. During 1996, it became obvious that Orion Home Video would not allow us to acquire any new anime properties for American theatrical or home-video release. Orion was satisfied to distribute its own editions of the videos that Streamline had already produced. Why? Orion never gave us an answer, but it was no secret that all during the 1990s Orion Home Video and its parent Orion Pictures were in financial trouble. During 1996 Orion Home Video presumably could not afford any new video production, including financially helping Streamline or even making Orion video boxes for new Streamline titles. Orion went briefly through Metromedia to MGM in 1997. The prints of Streamline’s anime that Orion had ended up in MGM’s vaults, and Orion’s contract with Streamline was taken over by MGM, which was even less interested in working with Streamline Pictures. Aside from the Robotech Perfect Collection videos that we never got the chance to finish, and the Megazone 23 and Space Cobra titles already mentioned, Streamline was planning to bring out the 12 Hi-Speed Jecy OAVs. In fact, I think that Carl may have already licensed the American rights, but Orion would not allow him to produce the English-language videos. Next week: Streamline Pictures, 1997 to the end. Fascinating stuff. 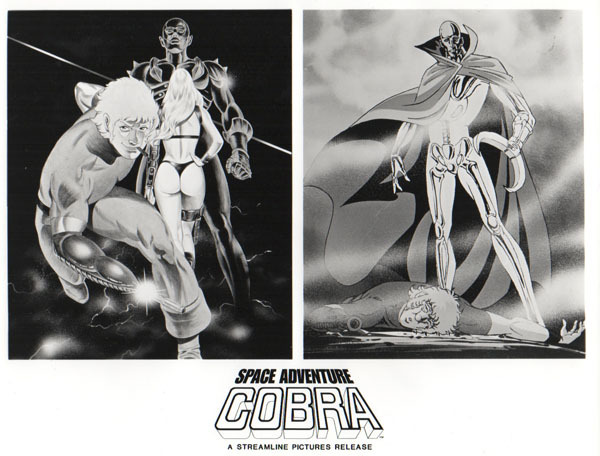 I always wondered why stuff like Space Adventure Cobra never made it onto home video. One question regarding Megazone 23: Fred, to the best of your recollection, was part 2 newly-dubbed for that theatrical premiere? There was a dubbed version included on the Japanese laserdisc (with funny changed names – Shogo Yahagi became “Johnny Winters”) that had all of the Intersound regular actors, but it seemed to me like it had been dubbed prior to the Streamline dub of part 1. Did Streamline dub part 2 as well? No. Or if it was dubbed, Streamline didn’t do it. With Streamline’s policy of keeping the original anime names (unless we had to change them for legal reasons, like calling Lupin III “The Wolf), we never would have renamed Shogo Yahagi “Johnny Winters”. I often believe that dub was done around early ’87 personally. I wish I knew more details than that, but it certainly predates Streamline by a year or two. Man, I forget that Orion was bought out by MGM and Streamline PIctures had to follow suit. No wonder Streamline didn’t last long after going to MGM in the late 90s. That was like being handcuffed to a corpse. Probably the one mistake Carl overlooked in dealing with another company (especially one like Orion). This post got me interested in Great Conquest. I had never heard of that one, but searching amazon and ebay I came across several Great Conquest things (games, other dvd’s that I don’t know if they are related). Are these games related to the anime? Any source for a copy of the film on dvd? Youtube has it broken up into parts and the quality of the transfer looks pretty poor. Thanks and very interesting post! Not sure about that, but there is a NES game based on the manga called ‘Destiny of an Emperor” that was released by Capcom. Wish I could help you there. Unless one wasn’t released in Japan over the past decade, I don’t think it was released on DVD in the US, though several titles Streamline licensed to Orion were released on DVD through Image Entertainment in the late 90’s like “Megazone 23 pt. 1” and “8Man After”. Does anyone remember the old days at rental stores such as Blockbuster. I have read elsewhere that someone who used to rent Streamline Dubbed Hokuto no Ken Movie on Orion pre-release VHS rental copy remember gore scenes uncensored with no blurring or filter. Anyone know that? I don’t recall that the Streamline release of the “Fist of the North Star” movie was ever blurred or filtered, theatrically or on video. Either the original Japanese movie was that way, or it was blurred and filtered by someone else after Streamline’s license expired and Toei resold it. The Movie was released uncensored first week it released in theaters in Japan on March, 1986. The gore scenes were now censored after complaints from Japanese PTA group. It was still censored on home video in Japan even the HD Remastered DVD release. I think there are still some of the uncut 35mm prints of the film in collector’s hands or the other company who haven’t used it yet. There are some Pre-release rental VHS copies that are fully uncensored, but someone has yet to post screenshots or video of all gore scenes uncensored and un-blurred. I am confused, but it sounds like the “complete” master that Toei supplied Streamline was in fact censored. Streamline did not do any censoring. Well. I saw the great conquest. I’ve seen thee uncut version of the first film and I can tell you that good scenes were cut. Other that that, it was good video to watch. I had no idea that Carl Macek paid Pat Morita a good fee to use him in the film. Many thanks for an interesting article. Oh well, they tried Kou. Man, that’s a bummer about Cobra. I loved the movie, and I love the dub Streamline did. 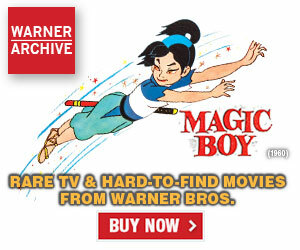 I would’ve loved to see the TV series released as well, same with Dirty Pair.